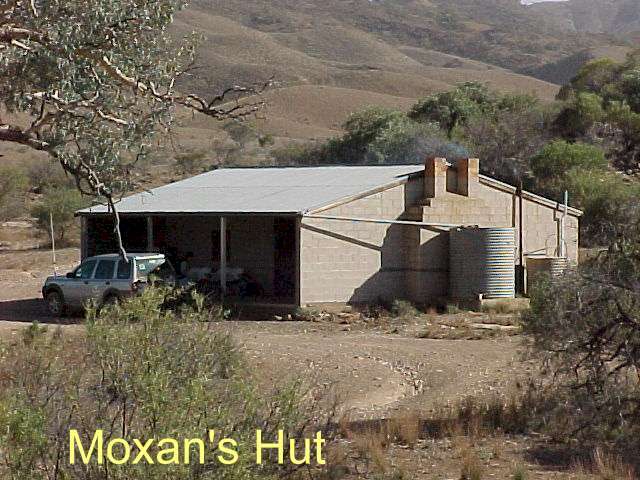 Moxan's Hut, Wilow Springs Station, Flinders Ranges. Click here to view the layout of the hut. Minimum nights and beds apply for peak periods which are South Australian School and Public Holidays from March to October. Minimum nights and beds apply for peak periods which are South Australian School and Public Holidays from Easter to October. Willow Springs Station is approximately 21km north of the Wilpena Pound turn off. To get to the hut you will require your own 4WD vehicle. The track to Moxan's Hut is approximately 15km from the Willow Springs homestead. Due care should be taken at a number of creek crossings and hills on the way to Moxan's Hut. You need to take bedding and food supplies. The lights are solar powered. You are advised to bring extra lighting in case there is cloudy days and the solar charger cannot charge the battery enough. The masonry building has an open front verandah for swags, one bedroom with 5 single beds with mattresses. Basic household utensils are supplied, kitchen with table and chairs a sink, gas stove, wood stove, no refrigeration, small open fireplace. The bathroom has a shower which has gas hot water and a septic toilet. Fire wood is not provided at the hut. As wood is not readily available in the vicinity of the hut it is advisable to gather wood on your journey to the hut. Please note: Due to the distance and time from the homestead and the low tarrif this building is not serviced on a regular basis. We request that you leave the building clean and tidy as you would hope to find it.